More than 1,500 people from 53 countries gathered at the National Theater of Korea, located at the foot of Mt. Nam in Seoul to explore the diversity of Korean performances at the 8th Performing Arts Market (PAMS). Organized by the Korea Arts Management Service and the National Theater of Korea, PAMS is the largest performing arts fair in Korea. It introduces selected Korean performances and international works; discusses the current state of the performing arts; and promotes networking of performing arts professionals from across the globe. For this year’s PAMS, 89 organizations — 73 from Korea and 16 from overseas — have installed booths. Four works from the Czech Republic, Slovakia, Poland and Hungary, were showcased as well. The highlight of the event is the PAMS Choice Showcase, which presented a selection of 13 theater, music, dance and multidisciplinary performances in order to help them reach a global audience. International visitors gave a big round of applause to each troupe presented unique shows. The art market will wrap up this year’s event today with the last showcase, “Stepmemories: Return of the Oppressed,” and a closing ceremony at the Total Museum of Contemporary Art in Pyeongchang-dong, central Seoul; but the fruits of PAMS will continue through further cooperation between Korean and international performing artists. The Performing Arts Market in Seoul (PAMS) is an annual converging marketplace where artists meet with theaters and festival directors to explore possibilities of making deals. This year’s PAMS began with a showcase of Yohangza Theatre Company’s “Hamlet.” The classic of Shakespeare was combined with exorcism rituals to comfort the souls of the dead. In the story line, Hamlet donning a sweat suit receives messages from his father the dead king through traditional Korean shamans. The shaman’s colorful regalia coupled with Hamlet’s craving for his father’s revenge creates a peculiar harmony. 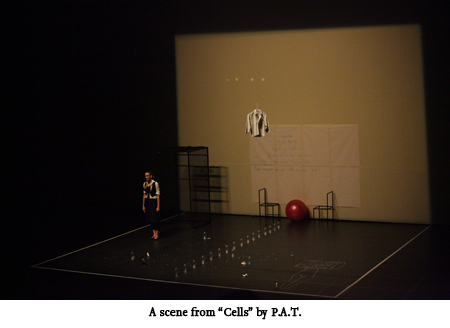 Interpreting “Hamlet” in such a spiritual, yet dynamic way was no doubt a sensation for the audience. After the opening ceremony and reception, some 90 booths of various performing arts organizations greeted visitors and introduced their works. Among the participating organizations were the Korean Traditional Percussion Institute and Now Dance Company, Cirque du Soleil and the Australia Council for Arts. Participants relocated to the Daloreum Theater of the National Theater of Korea at 4 p.m. to see the PAMS Choice pieces by which time they had already gathered heaps of exhibition brochures from the various booths. 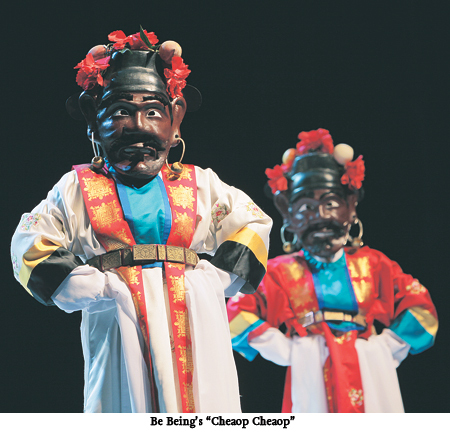 Be Being, a project group specializing in modernizing Korean traditional music, performed “Cheop Cheop,” a unique style of music originating from Korean court music. The group meticulously researched court music and added their own unique flavors to the original pieces. Combined with court-related images projected on screen, Be Being’s “Cheop Cheop” offered patrons a rare insight into Korean court music. Thierry Gourmelen of La Galerie Choregraphique from France attended the PAMS as the European representative of Dance Theater Chang. 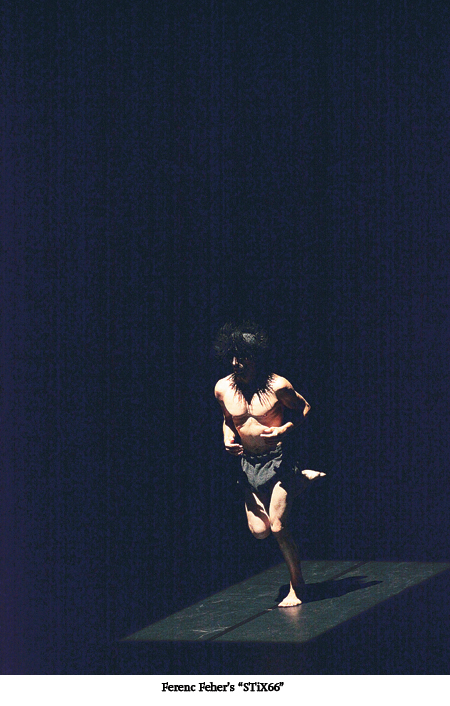 Dance Theater Chang is a modern dance troupe led by Kim Nam-jin, who danced with Cie Corinne Lanselle and Cie Jacky Taffanel in France. The troupe, known for incorporating more realistic choreography, presented “Passivity” at PAMS Choice Showcase Tuesday. Gourmelen said, “I have known Kim for many years in France, so when requested that I represent his dance company in Europe, I did not hesitate.” Thanks to Gourmelen, the troupe has so far performed twice this year in Europe, showcasing “Crazy Swan Lake” out of their repertoire. “We are planning to tour Europe next year and I hope to get more opportunity for Dance Theater Chang at this fair,” Gourmelen said. 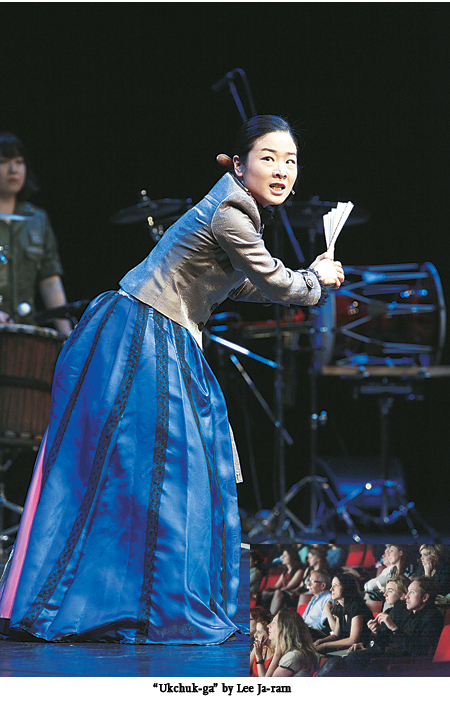 He also went on to see showcases of other Korean performers, including “Ukchuk-ga,” written and performed by Lee Ja-ram, a “pansori” (Korean traditional opera) singer. Lee presented a highlight of her original piece at PAMS Choice, Tuesday. 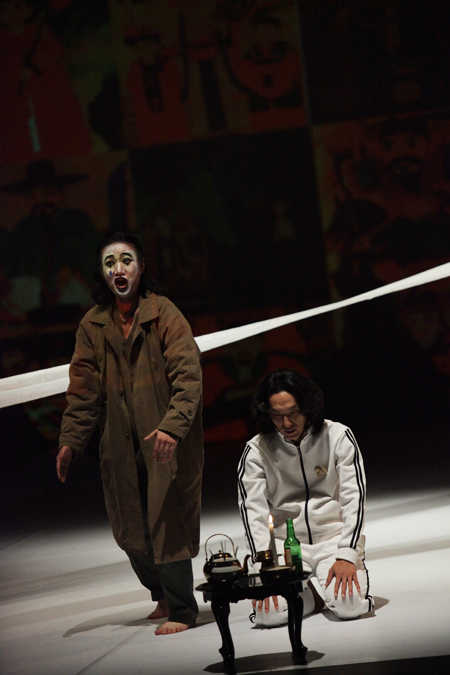 It is based on Bertolt Brecht’s “Mother Courage and Her Children” and Lee transformed it into a modernized pansori, personally performing more than 20 roles. Though the showcase was a 30-minute excerpt from the 160-minute show and performed in Korean with English subtitles, it was easy to notice the positive reception from the audience. Gourmelen described “Ukchuk-ga” as a “contemporary Korean project” that he was seeing for the first time. “I look for a new story and I’m not here to see some copy of other European or American style of art. This project’s roots are in tradition, but the music is not traditional and that’s what makes it interesting,” he said. 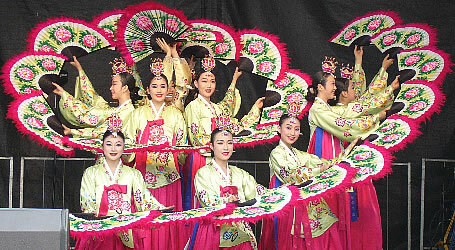 While in Korea, Gourmelen will also see SIDance, a dance festival in Seoul, and visit southern city of Jeonju to experience Korean traditional music and dance. Nedelcu mainly works with classical musicians, but is now determined to introduce traditional Korean music and performances to her colleagues. “I’m also keenly considering collaborating with Korean artists. We could present a Western piece or a Korean piece together and it should be welcomed everywhere,” she said. PAMS is a place for producing and distributing performing arts through exchanging information and networking. 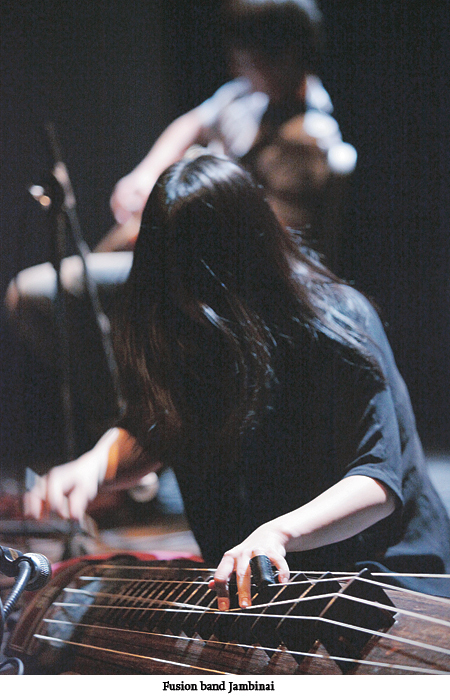 “The art market is now settled as a platform for Korean performances and aims to go abroad. We will also become a bridgehead for international performances entering into Korean and Asian market,” Jung Jae-wal, president of the Korea Arts Management Services, said. For more information about the art market, visit www.pams.or.kr.